Dr. Jim Mort grew up on a farm in Rhode Island where he developed a love for being around the entire spectrum of farm animals. Trail riding was one of his boyhood pleasures. Jim graduated from the University of Rhode Island in 1972 with a B.S. in Animal Science. He attended the Oklahoma State University College of Veterinary Medicine during which time he served as Vice President and President of the student AVMA. He graduated with a D.V.M. in 1977 and followed that with an internship in the ambulatory dept. of the Large Animal Clinic at Cornell University’s College of Veterinary Medicine. In 1978 Jim went to work for Drs. Miller and Mountan in Rhinebeck and two years later became a partner. 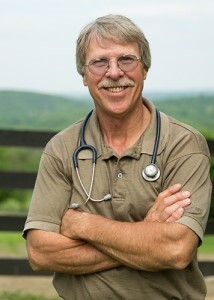 Jim is a member of the AVMA, AAEP, and the NY State Veterinary Medical Society. He resides in Red Hook with his wife Patty where together they enjoy fishing, golfing and kayaking.